The friendly face of train services in Essex and Suffolk has scooped three awards at the prestigious Association of Community Rail Partnerships Awards. 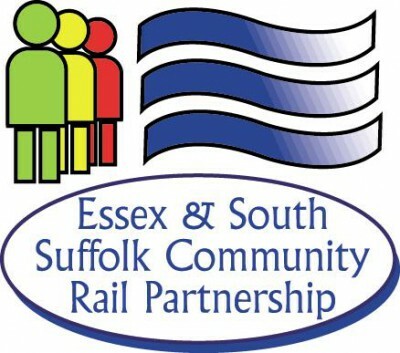 Essex and South Suffolk Community Rail Partnership (ESSCRP) was shortlisted in five categories of the national awards and achieved a podium finish in three of them. Artwork which has brightened up a shelter at Braintree Freeport Station, an artistic animal hunt and a volunteer who keeps Wrabness Station green and beautiful were all recognised at the awards ceremony which took place in Southport last week. Wrabness Station Volunteer Julia Prigg took second place in the Outstanding Volunteer Contribution category. She has been keeping the garden at the station beautiful for over seven years. The from ‘Dreary to Cheery’ transformation of Braintree Freeport Station’s shelter which saw the once drab shelter transformed with a series of bright and cheerful pictures of the bottom halves of shoppers came third in the Community Art Scheme category. There was also a bronze award for a competition which took place on the Sunshine Coast Line which saw 14 colourful paintings produced by people with a disability. These paintings were then displayed and travellers challenged to name five animals which could be found at five different stations and come up with a rail safety slogan. Cllr Eddie Johnson, Cabinet Member for Highways and Transport at Essex County Council, said: “We are delighted that the Community Rail Awards have recognised the hard work which we put in to creating a pleasant environment for travellers. “The schemes which have won exemplify the spirit of community rail networks, they are fantastic examples of the rail lines working with the local community to create a more enjoyable experience for all their travellers.